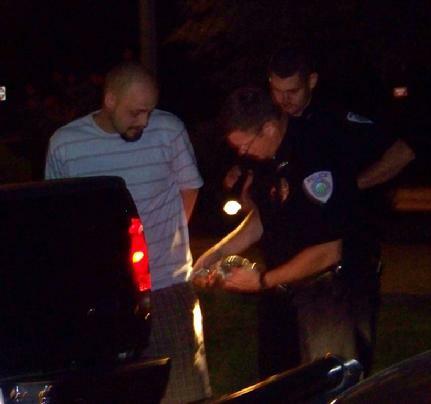 Livingston Police Officer Rob Atkins confiscates marijuana from Shawn Kimes. Two Men Busted for DWI and Possession, LIVINGSTON, July 5, 2008 - Shortly before midnight on July 4, 2008, Polk County Sheriff Detective, Lieutenant Craig Finegan was driving on FM-1988 near FM-3126. Finegan observed a blue 2004 Ford F-150 turn off of 3126. Finegan noticed that the truck was driving erratically. According to Finegan, the truck ran one car off the road and nearly collided head-on with another one. Finegan pulled the truck over into the parking lot of the Shell gas station next to Holiday Inn Express and Baskin's Department Store. The driver of the vehicle was Matthew Metzler, 27, of Livingston with his passenger, Shawn Kimes, 28, of Huntsville. Finegan was quickly accompanied by two Livingston Police patrol units, officer Rob Atkins and officer Kevin Ward. Upon searching the men, Atkins, who has extensive experience in narcotics law enforcement, confiscated a substantial amount of marijuana from Kimes. Both men were hand-cuffed and arrested for suspicion of driving while intoxicated and possession. Both men were loaded into Atkins' unit and taken to Polk County jail and booked in. Metzler's vehicle was towed away from the scene shortly after mid-night by Fawbush Towing and will be stored at Fawbush body shop on Highway 59 next to Lone Star Charlie's.